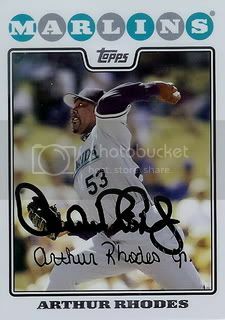 A few days before the end of the season, long-time reliever Arthur Rhodes signed a card for our set. Aruther just finished his 18th year with his seventh team. Thanks, Arthur! 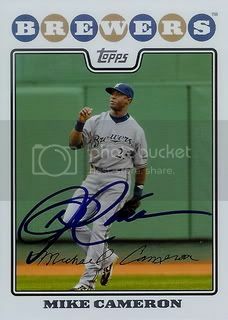 Minnesota Twins outfielder, Denard Span signed a card for our set. Denard had a good year in 2009. In his first full MLB season he hit .311 and stole 23 bases. Near the end of the season I sent a few cards to a friend on SportsGraphing.com for a 50/50. 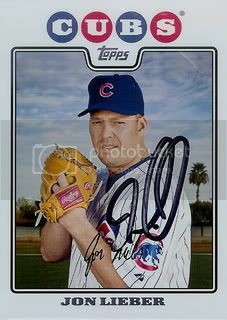 This one of reliever Evan Meek came back signed. From what I've heard Evan is a really cool guy. Sent out a request for this one last April. 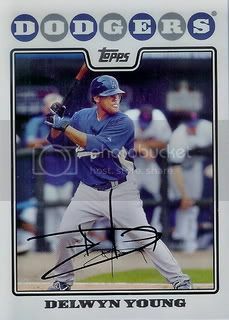 It took a little while but Sam Fuld returned our 08 Topps card signed in blue. Thanks, Sam! Got this one back last week. 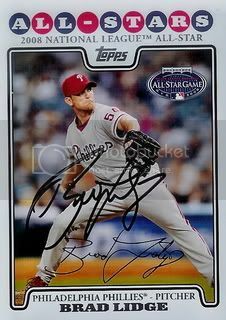 Two time All-Star Brad Lidge signed his card from the 08 Topps Updates & Highlights set. This was one of the last requests I sent out during the 2009 season. 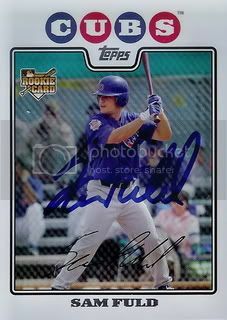 Brad's always been a good TTM signer and this card looks great! 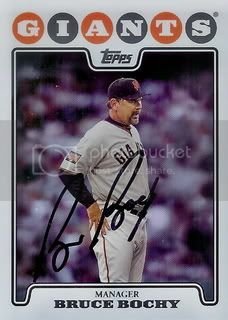 The final signed 08 Topps card from our trade is of current San Francisco Giants manager, Bruce Bochy. After a slight delay I am going to try to get back on track this weekend with the final two cards I received in a trade worked out on SweetSpotGraphs.com. It seems as though Hank Blalock's time in Texas has come to an end. Over the past 7 seasons he has been pretty reliable at third base for the Rangers. He hit over 150 home runs and drove in over 500 runs. 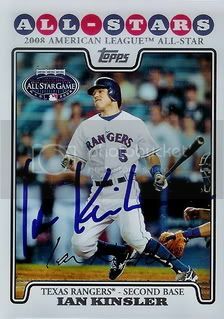 However, Hank's contract is up and I don't see the Rangers resigning him for 2010. 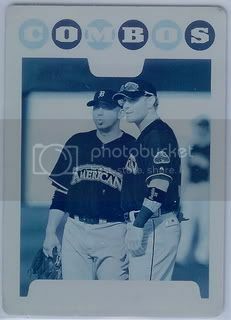 Hopefully he'll find a new home and be able to put up All-Star numbers again like he did in 2003 and 2004. 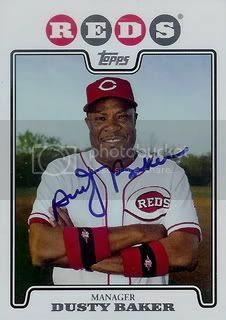 Our next card is of baseball legend, Dusty Baker. Dusty has done it all in his career. During his playing days he was a 2x All-Star, a World Series champion, and the 1977 NLCS MVP. 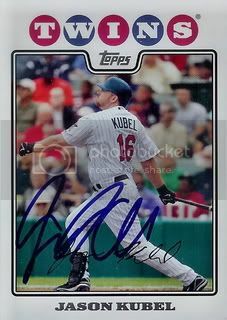 As a coach he has led the San Francisco Giants, the Chicago Cubs, and currently the Cincinnati Reds. He's even managed to win three NL Manager of the Year awards. If you're interested in following in Baker's footsteps, Sports Management Colleges offers relevant education sources. 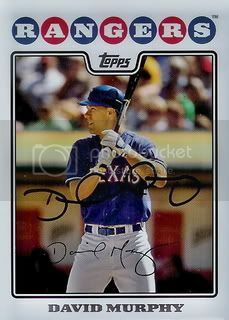 Our next signed 2008 Topps card is of former Dodger, Delwyn Young. Delwyn seems to have found a home in the outfield for the Pittsburgh Pirates. 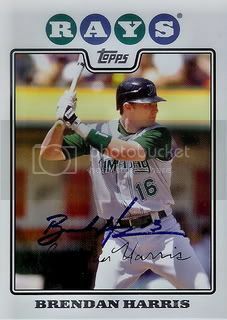 I remember when Brendan Harris was the big Chicago Cubs prospect. 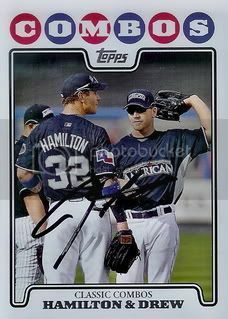 I was glad to be able to have him sign a few cards for me one Spring Training. 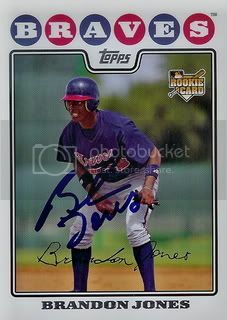 Now Brendan is with his fifth organization and is a utility infielder for the Minnesota Twins. 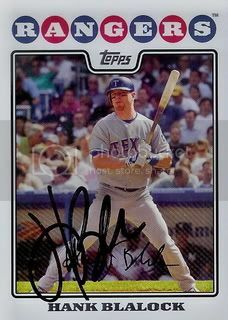 I always liked Ned Yost. 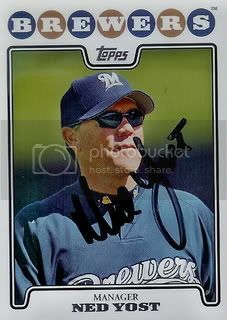 He did a pretty good job managing the Milwaukee Brewers. I understand why the let him ago but he did help turn around a dismal franchise. Hopefully he'll get another chance somewhere soon. It's November and Joe Blanton is pitching in another World Series. 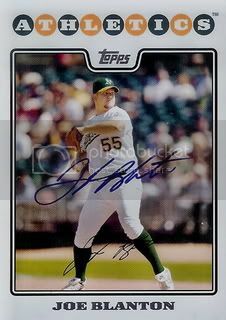 Joe was always a great guy when he was with the Oakland A's. It's great to see him having success in Philadelphia. A friend from SweetSpotGraphs.com sent us nine signed 08 Topps cards for our set. Our next nine posts will feature these cards. 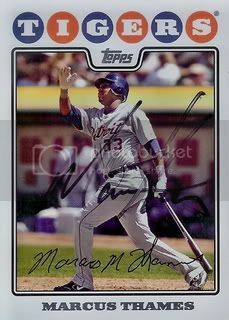 First up is former New York Yankee and current Detroit Tiger, Marcus Thames. 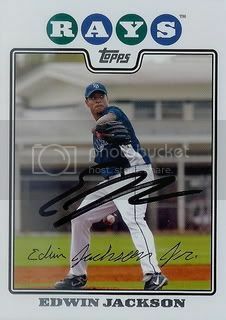 Back in May we sent a card to Detroit Tigers pitcher, Edwin Jackson. Earlier this month we received it back signed! Definitely worth the wait. Thanks, Edwin! 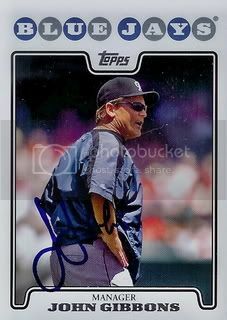 The second card zman40 from Autographed Cards sent me is of former Toronto Blue Jays manager, John Gibbons. I had no idea that John was a coach for the Kansas City Royals this year. I figured that I wouldn't be doing as many blog posts after the regular season ended. While that has been true it isn't for the reason I originally thought. I've gotten mail and plenty of cards to post about. I just haven't had time. Between work, Arizona Fall League games, and the swine flu it's been an interesting two weeks. 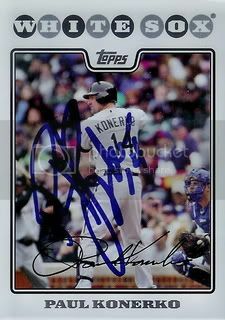 Not too long ago, zman40 from Autograph Cards sent us a nice little package with two signed cards. 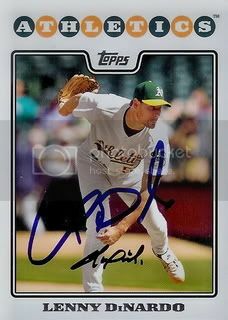 The first is of former Oakland Athletics pitcher, Lenny DiNardo. 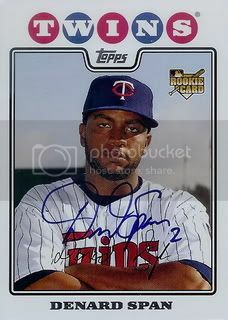 Zach was able to get Lenny's autograph during a recent trip to see one of the final Twins games at the old Metrodome. 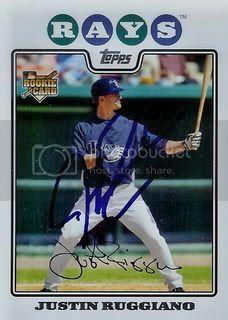 Yesterday I posted about the 2008 Topps Silk Collection card I bought of Andrew Miller. I also mentioned that Andrew Miller was playing in the Arizona Fall League. Last Thursday, my son and I headed over to Surprise to see the Mesa Solar Sox play against the Surprise Rafters. Of course we got there when the gates open and were ready to get some autographs. 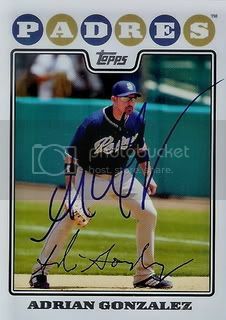 While concentrating on the Mesa side we got most of the players we wanted including Mr. Andrew Miller. 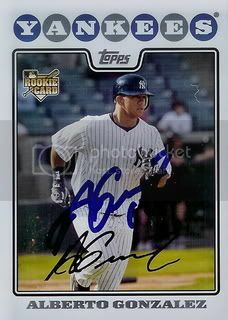 Andrew signed a few cards for us including the 2008 Topps Silk Collection. He had never seen this card before and asked what it was. 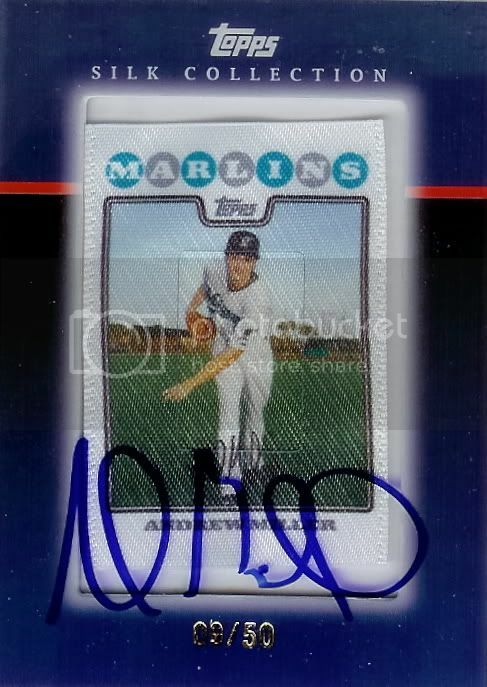 I did my best to quickly explain that they printed the regular Topps cards onto a piece of silk. He seemed to think it was kind of cool and joked that it probably came out of a pack that cost $50. 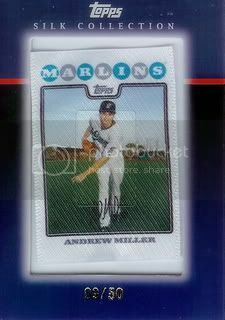 The second Topps Silk Collection card I found is of Florida Marlins pitcher, Andrew Miller. Andrew was a key part of the Tigers / Marlins trade that sent Miguel Cabrera to Detroit last year. He hasn't quite lived up to his potential but is only 24 years old. Andrew is currently playing in the Arizona Fall League for the Mesa Solar Sox. 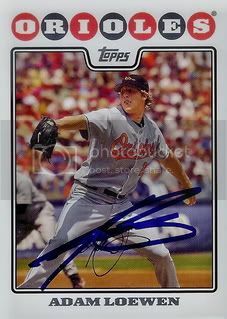 Can anyone guess what tomorrow's "08 Topps Silk Collection: Andrew Miller - Part Two" post will be? Wow! It's been 10 days since my last post. I've received a few more signed cards for our set but I haven't gotten a chance to scan them. 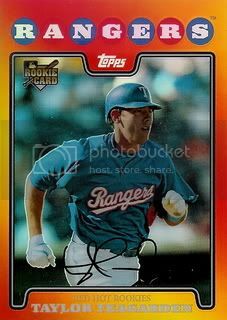 You may remember that back in June I purchased a Topps Silk Collection card of Chris Young. A few weeks ago I picked up two more of the Topps Silk Collection cards. 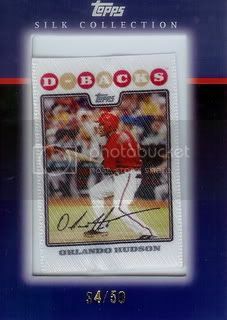 The first is of former Arizona Diamondbacks second baseman, Orlando Hudson. The are slowly starting to grow on me. 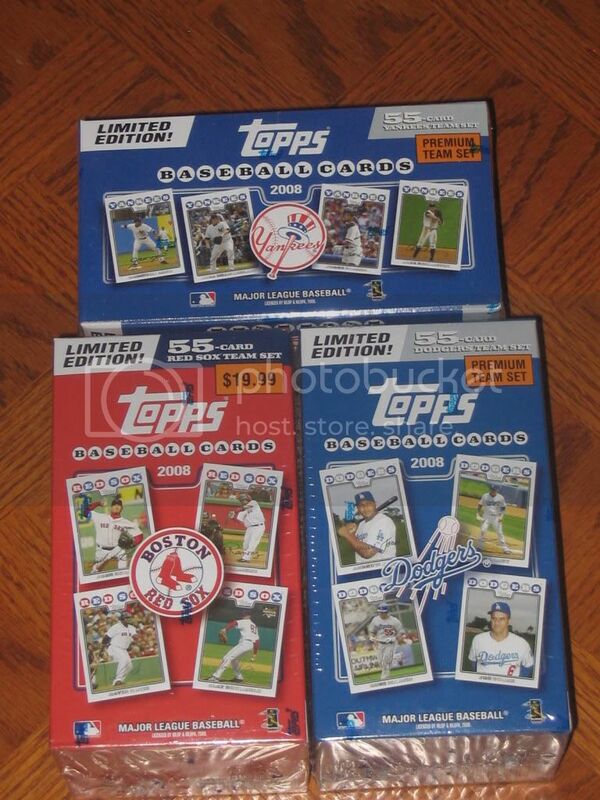 They're numbered to 50 and most have been going for only a few dollars. 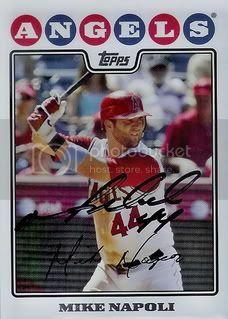 O-Dog was one of my favorite D-Backs the past few years so this was one that I was glad to add to our 08 Topps collection. 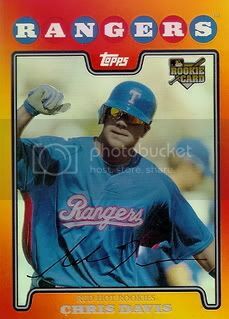 I've been a Zach Duke fan since he made his MLB debut back in 2005. 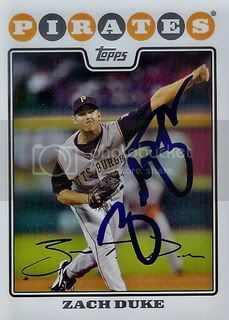 He won his first 5 starts for a dismal Pittsburgh Pirates team and was named National League Rookie of the Month for July. 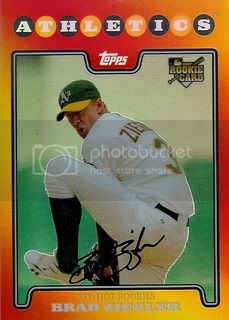 While he hasn't quite matched the success he had during his rookie year, Zach was named to the 2009 National League All-Star team. 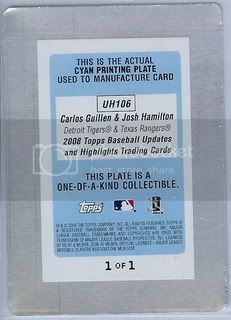 This is the fifth and final card from the eBay lot. 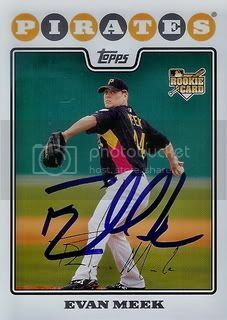 Zach has been great TTM signer in the past but I haven't seen any successes from him this season. 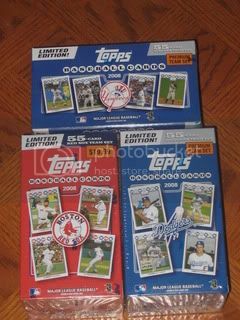 Hopefully we'll still get the 08 Topps card we sent but if not it's not big loss. 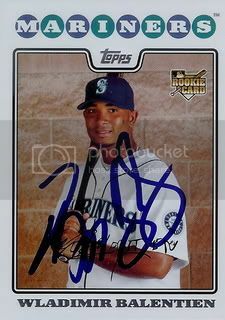 Another one from the lot... this one is of former Seattle Mariner Wladimir Balentien. 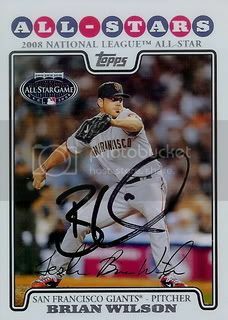 On July 29, 2009 the Mariners traded Balentien to the Cincinnati Reds for reliever Robert Manuel. 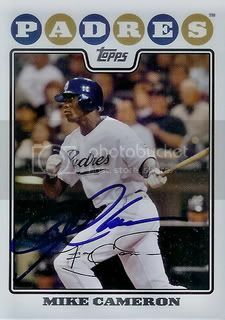 Card number three from the five card eBay lot is of former Mariners, Padres, Red Sox, Indians, and Rangers infielder Ramon Vazquez. 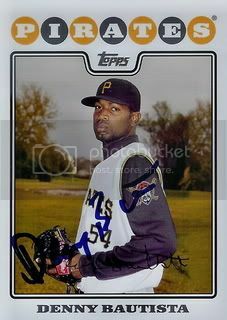 Ramon just finished up the 2009 season with his sixth team, the Pittsburgh Pirates. He hit .230 with 1 home run and 16 RBIs. 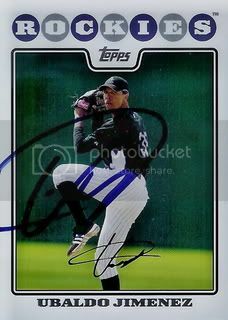 The second card from our eBay lot was of Alberto Gonzalez. 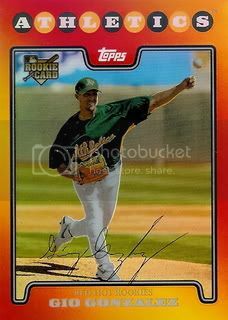 I don't know much about Alberto Gonzalez besides the fact that he had a card in the 2008 Topps Updates & Highlights set. 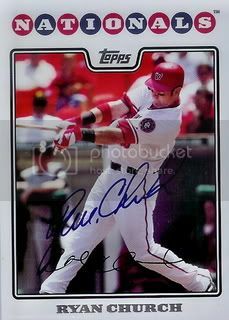 After a quick Google search I learned that Alberto is now in the Nationals system and played with the Syracuse Chiefs in 2009. He hit .311 but only had 90 at bats in 23 games. 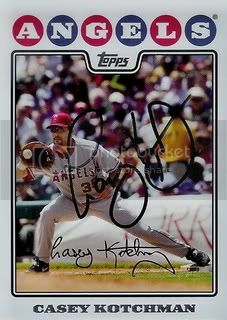 Picked up five more signed 2008 Topps cards in a recent eBay auction. None were too exciting but I'm always glad to add a few more cards. Today brought our 150th card for our set. A nice return from my son's favorite player. We wrote to Ryan Church back in May c/o the Mets before he was traded to the Braves. I thought there was a good chance we wouldn't see it again. Fortunately Ryan brought his mail with him during his move away from the Big Apple. Thanks, Ryan! 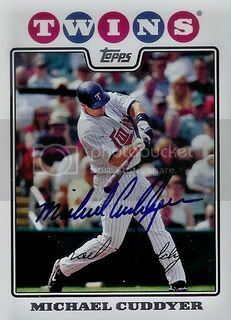 Minnesota Twins outfielder, Michael Cuddyer signed his card from Series 2 of the 2008 Topps set. Having already hit 30 home runs, Michael is definitely having a great season. Today brought another Texas Ranger for our set. 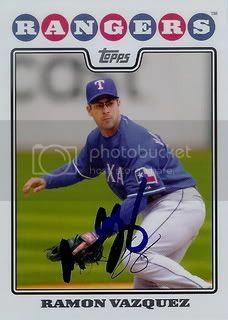 David Murphy kindly signed the card below. David had a big game this past Monday. He went 3 for 4 with a double and two RBI's. Unfortunately the Rangers have fallen out of contention in the AL Wild Card and AL West races. Will next year be the year that the Rangers keep the Angels out of the post season? This blogger says yes! Another one for the set! 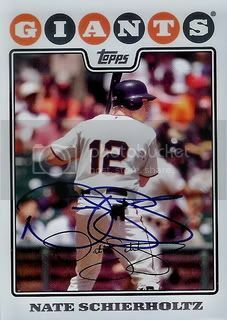 San Francisco Giants right fielder, Nate Schierholtz signed the card below. Nate's done pretty well when they've given him a chance to play ( .272/5/29 in 100 games).